Superb construction with heavily ribbed Meehanite cast construction. Full contact Double Vee for true tracking and unrivaled accuracy. User-friendly “Touch & Teach” conversational programming simplifies set-up and operation even for operators unfamiliar with CNC. Ideal for Surface, Slot, Step, Form and Contour Grinding. Set up to 4 different table stroke positions. 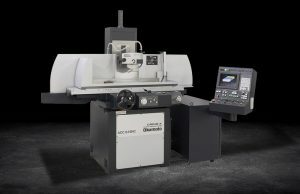 Ideal for multiple workpiece grinding. 3-point diamond dresser includes one 2-point angle dresser for form dressing and one 1-point dresser for straight dressing.